If you're unsure about any wild food, don't eat it. It's better to be safe than sorry. Don’t collect food from road or railway verges in case it is polluted. Never damage or destroy a plant or tree when picking leaves or fruit and always leave more on the plant than you pick so birds and wildlife have enough food to survive on. Don’t trespass or forage on private land unless you have permission. Don’t take dogs foraging as they can disturb wildlife and cause harm to rare species. One of the easiest forage foods to identify is the dandelion and some children get a sum of money from a parent for every dandelion they dig out of the garden or allotment which makes it double the fun! Try to take out the whole very long and deep root as this is what gives the coffee its lovely flavour, which is something between cocoa and hazelnuts. You need around 25 small roots or 12 large ones to produce a cup of dandelion coffee! Preheat oven to 200C (Gas Mark 6). Cut away all green growth and then wash the roots really well to remove all the soil before patting them dry. Put them on a baking tray and roast for about 20 minutes, by which time they should become like dry brownish sticks. If you have roots of different sizes you may find the smaller ones are dry after 15 minutes so take them out and leave the others to desiccate further. Once all the roots are dry and sticklike, grind them in a blender or coffee grinder. Add 250 ml (a mugful) of boiling water and allow to stand for three minutes before adding sugar to taste and drinking. 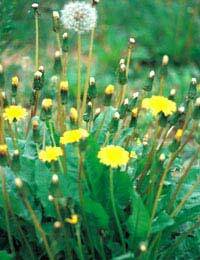 Dandelion coffee is caffeine-free and it’s said to be good for the digestion. This plant (Allium ursinum) is also known as Ransoms or Bears Garlic. It grows in woodland and can often be found in or near patches of bluebells. The leaves are long and straplike, something like Lily of the Valley but can be identified by the mild garlic odour. By the time the starry white flowers appear it is late in the season and the leaves will be rather stringy to eat. Unlike the garlic grown for cooking, only wild garlic leaves are used when foraging because the bulbs, although edible, are small and few in number. You can simply cut leaves from the plant and leave the bulb in the ground for another harvest next year. Use the leaves in salads or cut them up finely, like chives and cook in an omelette. For a special treat, chop wild garlic leaves and mash into potato with a little double cream – it’s really delicious!